The thermal characteristic length, usually represented by letter $\Lambda'$, is a parameter used to describe the thermal effects at medium and high acoustical frequencies. This parameter has been introduced by Champoux and Allard [CA91] on the basis of Johnson, Koplik and Dashen work [JKD87] related to viscous effects. 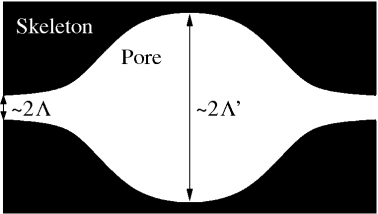 Schematic representations of a 2-Dimensional pore, the viscous characteristic length $\Lambda$ and the thermal characteristic length $\Lambda'$. The thermal characteristic length, controlling the thermal effects at medium and high acoustical frequencies is related to the largest size of the pores. The thermal characteristic length can be estimated from standing wave tube measurements or ultrasound techniques.